American biochemist mission specialist astronaut 1978-2012. Biochemist, first American woman to make a long-duration space station mission. Status: Inactive; Active 1978-2012. Born: 1943-01-14. Spaceflights: 5 . Total time in space: 223.12 days. Birth Place: Shanghai. Lucid had a thick Oklahoma ('Sooner') accent, which she shared with astronaut Tom Stafford. She was utterly dedicated to her work, and indifferent to office politics. On one mission her crew included Saudi Prince Sultan. When the crew visited Saudi Arabia, a flap developed when Lucid was told she could not enter the country unless being accompanied by a male family member. 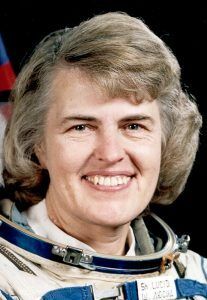 She refused and Saudi Arabia offered to designate her an honorary man, which caused no end of ribbing from the male chauvinists in the astronaut corps. PERSONAL DATA: Born January 14, 1943, in Shanghai, China, but considers Bethany, Oklahoma, to be her hometown. Married to Michael F. Lucid of Indianapolis, Indiana. They have two daughters and one son, five granddaughters and one grandson. Dr. Lucid enjoys flying, camping, hiking and reading. Her parents, Mr. and Mrs. Joseph O. Wells, are deceased. EDUCATION: Graduated from Bethany High School, Bethany, Oklahoma, in 1960; received a bachelor of science degree in chemistry from the University of Oklahoma in 1963 and a master of science and doctor of philosophy degree in biochemistry from the University of Oklahoma in 1970 and 1973, respectively. AWARDS: Dr. Lucid is the recipient of numerous awards. EXPERIENCE: Dr. Lucid's experience includes a variety of academic assignments, such as teaching assistant at the University of Oklahoma's Department of Chemistry from 1963 to 1964; senior laboratory technician at the Oklahoma Medical Research Foundation from 1964 to 1966; chemist at Kerr-McGee, Oklahoma City, Oklahoma, 1966 to 1968; graduate assistant at the University of Oklahoma Health Science Center's Department of Biochemistry and Molecular Biology from 1969 to 1973 and research associate with the Oklahoma Medical Research Foundation in Oklahoma City, Oklahoma, from 1974 until her selection to the astronaut candidate training program. Dr. Lucid is a commercial, instrument and multi-engine rated pilot. NASA EXPERIENCE: Selected by NASA in January 1978, Dr. Lucid became an astronaut in August 1979. She is qualified for assignment as a mission specialist on Space Shuttle flight crews. Some of her technical assignments have included the Shuttle Avionics Integration Laboratory (SAIL); the Flight Software Laboratory, in Downey, California, working with the rendezvous and proximity operations group; Astronaut Office interface at Kennedy Space Center, Florida, participating in payload testing, Shuttle testing and launch countdowns; spacecraft communicator (CAPCOM) in the Johnson Space Center (JSC) Mission Control Center during numerous Space Shuttle missions; Chief of Mission Support and Chief of Astronaut Appearances. A veteran of five space flights, Dr. Lucid has logged 5,354 hours (223 days) in space. 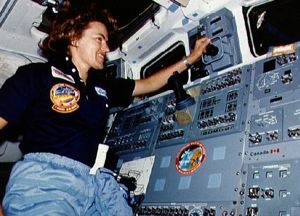 She served as a mission specialist on STS-51G (June 17 to June 24, 1985), STS-34 (October 18 to October 23, 1989), STS-43 (August 2 to August 11, 1991), STS-58 (October 18 to November 1, 1993), and as a board engineer 2 on Russia's Space Station Mir (launching March 22, 1996, aboard STS-76 and returning September 26, 1996, aboard STS-79). Dr. Lucid was the first woman to hold an international record for the most flight hours in orbit by any non-Russian, and, until June 2007, she also held the record for the most flight hours in orbit by any woman in the world. From February 2002 until September 2003, Dr. Lucid served as NASA's Chief Scientist stationed at NASA Headquarters, Washington D.C., with responsibility for developing and communicating the agency's science and research objectives to the outside world. She returned to JSC in Fall 2003 and resumed technical assignments in the Astronaut Office. She served as a CAPCOM in the Mission Control Center for numerous Space Shuttle and International Space Station (ISS) crews, representing the Flight Crew Office and providing a friendly voice for dozens of friends and colleagues in space. Dr. Lucid retired from NASA in January 2012. SPACE FLIGHT EXPERIENCE: STS-51G Discovery (June 17 to June 24, 1985) was a 7-day mission, during which the crew deployed communications satellites for Mexico (Morelos), the Arab League (Arabsat) and the United States (AT&T Telstar). They used the Remote Manipulator System (RMS) to deploy and later retrieve the SPARTAN satellite, which performed 17 hours of x-ray astronomy experiments while separated from the Space Shuttle. In addition, the crew activated the Automated Directional Solidification Furnace (ADSF), six Getaway Specials and participated in biomedical experiments. The mission was accomplished in 112 orbits of the Earth, traveling 2.5 million miles in 169 hours and 39 minutes. Landing was at Edwards Air Force Base (EAFB), California. STS-34 Atlantis (October 18 to October 23, 1989) was a 5-day mission during which the deployed the Galileo spacecraft, on its journey to explore Jupiter, operated the Shuttle Solar Backscatter Ultraviolet Instrument (SSBUV) to map atmospheric ozone and performed numerous secondary experiments involving radiation measurements, polymer morphology, lightning research, microgravity effects on plants and a student experiment on ice crystal growth in space. The mission was accomplished in 79 orbits of the Earth, traveling 1.8 million miles in 119 hours and 41 minutes. Landing was at Edwards Air Force Base, California. STS-43 Atlantis (August 2 to August 11, 1991) was a 9-day mission, during which the crew deployed the fifth Tracking and Data Relay Satellite (TDRS-E). The crew also conducted 32 physical, material and life science experiments, mostly relating to the Extended Duration Orbiter and Space Station Freedom. The mission was accomplished in 142 orbits of the Earth, traveling 3.7 million miles in 213 hours, 21 minutes and 25 seconds. STS-43 Atlantis was the eighth Space Shuttle to land at KSC. STS-58 Columbia (October 18 to November 1, 1993). This record duration 14-day mission was recognized by NASA management as the most successful and efficient Spacelab flight flown by NASA. The STS-58 crew performed neurovestibular, cardiovascular, cardiopulmonary, metabolic and musculoskeletal medical experiments on themselves and 48 rats, expanding our knowledge of human and animal physiology both on Earth and in spaceflight. In addition, they performed 16 engineering tests aboard the Orbiter Columbia and 20 Extended Duration Orbiter Medical Project experiments. The mission was accomplished in 225 orbits of the Earth, traveling 5.8 million miles in 336 hours, 13 minutes and 1 second. Landing was at Edwards Air Force Base, California. In completing this flight, Dr. Lucid logged 838 hours and 54 minutes in space. Dr. Lucid currently holds the United States single-mission spaceflight endurance record on the Russian Space Station Mir. Following a year of training in Star City, Russia, her journey started with liftoff at KSC on March 22, 1996, aboard STS-76 Atlantis. Following docking, she transferred to the Mir Space Station. Assigned as a board engineer 2, she performed numerous life science and physical science experiments during the course of her stay aboard Mir. Her return journey to KSC was made aboard STS-79 Atlantis on September 26, 1996. In completing this mission, Dr. Lucid traveled 75.2 million miles in 188 days, 4 hours, 0 minutes and 14 seconds. Born January 14, 1943, in Shanghai, China, but considers Bethany, Oklahoma, to be her hometown. Married to Michael F. Lucid of Indianapolis, Indiana. They have two daughters and one son. She enjoys flying, camping, hiking, and reading. Her parents, Mr. and Mrs. Joseph O. Wells, reside in Bethany. Graduated from Bethany High School, Bethany, Oklahoma, in 1960; received a bachelor of science degree in chemistry from the University of Oklahoma in 1963, and master of science and doctor of philosophy degrees in biochemistry from the University of Oklahoma in 1970 and 1973, respectively. The recipient of numerous awards, Dr. Lucid most recently was awarded the Congressional Space Medal of Honor by the President of the United States. She is the first and only woman to have earned this prestigious award. Dr. Lucid was also awarded the Order of Friendship Medal by Russian President Boris Yeltsin. This is one of the highest Russian civilian awards and the highest award that can be presented to a non-citizen. Dr. Lucid's experience includes a variety of academic assignments, such as teaching assistant at the University of Oklahoma's Department of Chemistry from 1963 to 1964; senior laboratory technician at the Oklahoma Medical Research Foundation from 1964 to 1966; chemist at Kerr-McGee, Oklahoma City, Oklahoma, 1966 to 1968; graduate assistant at the University of Oklahoma Health Science Center's Department of Biochemistry and Molecular Biology from 1969 to 1973; and research associate with the Oklahoma Medical Research Foundation in Oklahoma City, Oklahoma, from 1974 until her selection to the astronaut candidate training program. Dr. Lucid is a commercial, instrument, and multi-engine rated pilot. Selected by NASA in January 1978, Dr. Lucid became an astronaut in August 1979. She is qualified for assignment as a mission specialist on Space Shuttle flight crews. Some of her technical assignments have included: the Shuttle Avionics Integration Laboratory (SAIL); the Flight Software Laboratory, in Downey, California, working with the rendezvous and proximity operations group; Astronaut Office interface at Kennedy Space Center, Florida, participating in payload testing, Shuttle testing, and launch countdowns; spacecraft communicator (CAPCOM) in the JSC Mission Control Center during numerous Space Shuttle missions; Chief of Mission Support; Chief of Astronaut Appearances. A veteran of five space flights, Dr. Lucid has logged 5,354 hours (223 days) in space. She served as a mission specialist on STS-51G (June 17-24, 1985), STS-34 (October 18-23, 1989), STS-43 (August 2-11, 1991), STS-58 (October 18 to November 1, 1993), and most recently served as a Board Engineer 2 on Russia's Space Station Mir (launching March 22, 1996 aboard STS-76 and returning September 26, 1996 aboard STS-79). Dr. Lucid holds an international record for the most flight hours in orbit by any non-Russian, and holds the record for the most flight hours in orbit by any woman in the world. STS-51G Discovery (June 17-24, 1985) was a 7-day mission during which crew deployed communications satellites for Mexico (Morelos), the Arab League (Arabsat), and the United States (AT&T Telstar). They used the Remote Manipulator System (RMS) to deploy and later retrieve the SPARTAN satellite which performed 17 hours of x-ray astronomy experiments while separated from the Space Shuttle. In addition, the crew activated the Automated Directional Solidification Furnace (ADSF), six Getaway Specials, and participated in biomedical experiments. The mission was accomplished in 112 orbits of the Earth, traveling 2.5 million miles in 169 hours and 39 minutes. Landing was at Edwards Air Force Base (EAFB), California. STS-34 Atlantis (October 18-23, 1989) was a 5-day mission during which she deployed the Galileo spacecraft on its journey to explore Jupiter, operated the Shuttle Solar Backscatter Ultraviolet Instrument (SSBUV) to map atmospheric ozone, and performed numerous secondary experiments involving radiation measurements, polymer morphology, lightning research, microgravity effects on plants, and a student experiment on ice crystal growth in space. The mission was accomplished in 79 orbits of the Earth, traveling 1.8 million miles in 119 hours and 41 minutes. Landing was at Edwards Air Force Base, California. STS-43 Atlantis (August 2-11, 1991) was a nine-day mission during which the crew deployed the fifth Tracking and Data Relay Satellite (TDRS-E). The crew also conducted 32 physical, material, and life science experiments, mostly relating to the Extended Duration Orbiter and Space Station Freedom. The mission was accomplished in 142 orbits of the Earth, traveling 3.7 million miles in 213 hours, 21 minutes, 25 seconds. STS-43 Atlantis was the eighth Space Shuttle to land at KSC). STS-58 Columbia (October 18 to November 1, 1993). This record duration fourteen-day mission was recognized by NASA management as the most successful and efficient Spacelab flight flown by NASA. The STS-58 crew performed neurovestibular, cardiovascular, cardiopulmonary, metabolic, and musculoskeletal medical experiments on themselves and 48 rats, expanding our knowledge of human and animal physiology both on earth and in space flight. In addition, they performed 16 engineering tests aboard the Orbiter Columbia and 20 Extended Duration Orbiter Medical Project experiments. The mission was accomplished in 225 orbits of the Earth, traveling 5.8 million miles in 336 hours, 13 minutes, 01 seconds. Landing was at Edwards Air Force Base, California. In completing this flight Dr. Lucid logged 838 hours, 54 minutes in space making her America's female space traveler with the most hours in space. Dr. Lucid currently holds the United States single mission space flight endurance record on the Russian Space Station Mir. Following a year of training in Star City, Russia, her journey started with liftoff at Kennedy Space Center, Florida, on March 22, 1996 aboard STS-76 Atlantis. Following docking, she transferred to the Mir Space Station. Assigned as a Board Engineer 2, she performed numerous life science and physical science experiments during the course of her stay aboard Mir. Her return journey to KSC was made aboard STS-79 Atlantis on September 26, 1996. In completing this mission Dr. Lucid traveled 75.2 million miles in 188 days, 04 hours, 00 minutes, 14 seconds. Degree: PhD. Marital Status: Married. Children: Three children. Childhood: Grew up in Bethany, Oklahoma.. Education: Oklahoma. Family: Astronaut. Country: China, USA. Spacecraft: Mir. Flights: STS-51-AA, STS-51-G, STS-34, STS-43, STS-58, STS-76 Mir NASA-1, STS-79, STS-79 Mir NASA-2. Projects: STS. Bibliography: 12, 4457, 5724. 1943 January 14 - . Birth of Dr Shannon Matilda Wells Lucid - . Nation: China, USA. Related Persons: Lucid. American biochemist mission specialist astronaut 1978-2012. 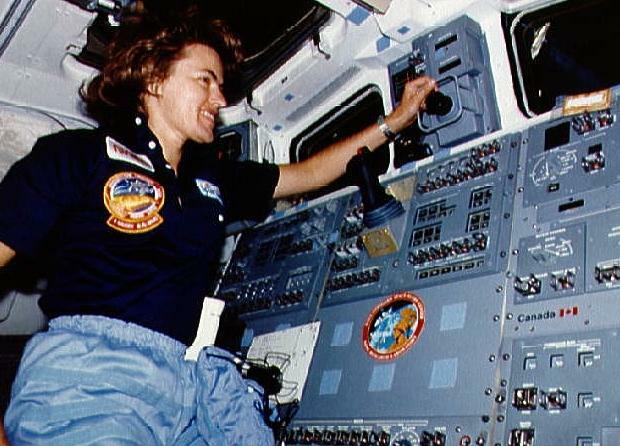 Biochemist, first American woman to make a long-duration space station mission. 5 spaceflights, 223.1 days in space. Flew to orbit on STS-51G (1985), STS-34, STS-43, STS-58, STS-76..
1989 October 18 - . 16:53 GMT - . Launch Site: Cape Canaveral. Launch Complex: Cape Canaveral LC39B. Launch Platform: MLP1. LV Family: Shuttle. Launch Vehicle: Space Shuttle. STS-34 - . Call Sign: Atlantis. Crew: Baker, Chang-Diaz, Lucid, McCulley, Williams, Donald. Payload: Atlantis F05 / Galileo [IUS]. Mass: 22,064 kg (48,642 lb). Nation: USA. Related Persons: Baker, Chang-Diaz, Lucid, McCulley, Williams, Donald. Agency: NASA Houston. Program: STS. Class: Manned. Type: Manned spaceplane. Flight: STS-34. Spacecraft Bus: Shuttle. Spacecraft: Atlantis. Duration: 4.99 days. Decay Date: 1989-10-23 . USAF Sat Cat: 20297 . COSPAR: 1989-084A. Apogee: 307 km (190 mi). Perigee: 298 km (185 mi). Inclination: 34.30 deg. Period: 90.60 min. Manned five crew. Deployed Galileo .Payloads: Deploy IUS with Galileo spacecraft. Shuttle Solar Backscatter Ultraviolet (SSBUV), Polymer Morphology (PM) experiments, IMAX camera project, Mesoscale Lightning Experiment (MLE), Air Force Maui Optical Site (AMOS) experiment, Growth Hormone Concentration and Distribution (GHCD) in Plants experiment, Sensor Technology Experiment (STEX), SSIP Student Experiment (SE) 82-15, Ice Crystals Experiment. First flight at this inclination. 1989 October 23 - . Landing of STS-34 - . Return Crew: Baker, Chang-Diaz, Lucid, McCulley, Williams, Donald. Nation: USA. Related Persons: Baker, Chang-Diaz, Lucid, McCulley, Williams, Donald. Program: STS. Flight: STS-34. STS-34 landed at 16:41 GMT. .
1991 August 2 - . 15:02 GMT - . Launch Site: Cape Canaveral. Launch Complex: Cape Canaveral LC39A. Launch Platform: MLP1. LV Family: Shuttle. Launch Vehicle: Space Shuttle. STS-43 - . Call Sign: Atlantis. Crew: Adamson, Baker, Mike, Blaha, Low, Lucid. Payload: Atlantis F09 / TDRS 5 [IUS]. Mass: 21,265 kg (46,881 lb). Nation: USA. Related Persons: Adamson, Baker, Mike, Blaha, Low, Lucid. Agency: NASA Houston. Program: STS. Class: Manned. Type: Manned spaceplane. Flight: STS-43. Spacecraft Bus: Shuttle. Spacecraft: Atlantis. Duration: 8.89 days. Decay Date: 1991-08-11 . USAF Sat Cat: 21638 . COSPAR: 1991-054A. Apogee: 306 km (190 mi). Perigee: 301 km (187 mi). Inclination: 28.50 deg. Period: 90.60 min. Manned five crew. Deployed TDRS 5 satellite. Payloads: Tracking and Data Relay Satellite (TDRS)-E/lnertial Upper Stage (lUS), Space Station Heatpipe Advanced Radiator Element (SHARE)-ll, Shuttle Solar Backscatter Ultraviolet (SSBUV) instrument 03, Optical Communications Through the Shuttle Window (OCTW), Air Force Maui Optical Site (AMOS) Calibration Test, Auroral Photography Experiment (APE)-B, Bioserve-lnstrumentation Technology Associates Materials Dispersion Apparatus (BlMDA)-02, Investigations Into Polymer Membrane Processing (IPMP)-03, Protein Crystal Growth Ill Block Il, Space Acceleration Measure-ment System (SAMS), Solid Surface Combustion Experiment (SSCE)-02, Tank Pressure Control Experiment (TPCE). 1991 August 11 - . Landing of STS-43 - . Return Crew: Adamson, Baker, Mike, Blaha, Low, Lucid. Nation: USA. Related Persons: Adamson, Baker, Mike, Blaha, Low, Lucid. Program: STS. Flight: STS-43. STS-43 landed at 12:28 GMT. .
1996 March 22 - . 08:13 GMT - . Launch Site: Cape Canaveral. Launch Complex: Cape Canaveral LC39B. Launch Platform: MLP2. LV Family: Shuttle. Launch Vehicle: Space Shuttle. STS-76 - . Call Sign: Atlantis. Crew: Chilton, Clifford, Godwin, Lucid, Searfoss, Sega. Payload: Atlantis F16 / Spacehab-SM. Mass: 6,753 kg (14,887 lb). Nation: USA. Related Persons: Chilton, Clifford, Godwin, Lucid, Searfoss, Sega. Agency: NASA Houston. Program: Mir. Class: Manned. Type: Manned spaceplane. Flight: Soyuz TM-23, STS-76, STS-76 Mir NASA-1. Spacecraft Bus: Shuttle. Spacecraft: Atlantis. Duration: 9.22 days. Decay Date: 1996-03-31 . USAF Sat Cat: 23831 . COSPAR: 1996-018A. Apogee: 398 km (247 mi). Perigee: 394 km (244 mi). Inclination: 51.70 deg. Period: 88.80 min. Shuttle-Mir Mission 3. Docked with the Mir space station 24 March 1996; Shannon Lucid was left on Mir for an extended stay. First American EVA on Mir. Payloads: SPACEHAB/Mir 03; KidSat; Shuttle Amateur Radio Experiment (SAREX) II, Configuration M; RME 1304�Mir/ Environmental Effects Payload (MEEP); orbiter docking system RME 1315; Trapped Ions in Space Experiment (TRIS); Extravehicular Activity Development Flight Test (EDFT) 04. 1996 September 26 - . Landing of STS-79 - . Return Crew: Akers, Apt, Lucid, Readdy, Walz, Wilcutt. Nation: USA. Related Persons: Akers, Apt, Lucid, Readdy, Walz, Wilcutt. Program: Mir. Flight: Soyuz TM-24, STS-76 Mir NASA-1, STS-79, STS-79 Mir NASA-2. STS-79 landed at 12:13 GMT with the crew of Lucid, Readdy, Wilcutt, Akers, Apt and Walz aboard..